I wanted to provide a bit of a quickie review this time out--things are very hectic but I'm still looking to get a lot of blog entries done over this coming week. Without further ado, let's find out if Jeff Parker & Gabriel Hardman's "jumping-on point" Hulk #30.1 is worth the $2.99! The Hulk's entry into the "Marvel Point One" initiative, designed to lure new readers by offering a new, one-month-only low price point, begins with the right kind of story: a done-in-one that introduces the main player and a new, key antagonist while at the same time advancing the status quo. It's got a creative team consisting of the regular writer and pencil artist, teamed with a classic Marvel inker (Tom Palmer) and a cover artist of some renown to Hulk fans (Ron Garney). So far, so good, right? The first page of this book has always featured a recounting of previous events, and this one's no different, and perhaps more important than all the others, because in an issue that's featured as a "jump-on point" at a special price point, you've got to show and tell why such a book deserves a reader's hard-earned cash. (Interestingly, there's only one more issue at $3.99; with issue #32, the book becomes $2.99 regularly, for the first time since issue #9.) The recap page tells all the basics of who the Red Hulk is, and we're off to the races with "Thunderbolt" Ross being attacked by the air command center that bears his name, commanded by the newly-promoted General Fortean, a former subordinate of Ross'. 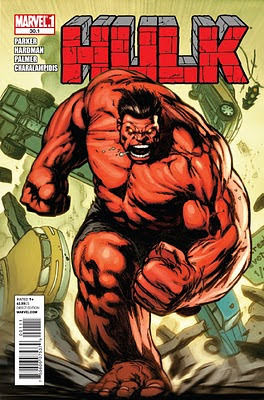 At first I wondered why we were seeing a new military enemy for the Red Hulk when "World War Hulks" had apparently brought back the perfect man for the task: Colonel Glenn Talbot, Ross' former second-in-command at Gamma Base and Bruce Banner's rival for his daughter Betty's affections. 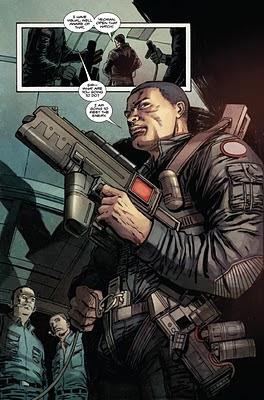 Of course, Talbot was revealed to be a Life-Model Decoy in Hulk #23, and Greg Pak revealed the real Talbot to still be dead during the "Chaos War" crossover. After reading this issue, having Ross' chief military adversary not being Talbot makes total sense, and I'm 100% behind writer Jeff Parker this outing. Fortean does not possess the familiarity with Bruce Banner and Betty Ross that Talbot does. To him, the Red Hulk is the adversary that killed his commanding officer, and the entire government seems intent on telling some other story that absolves the creature of all his guilt. Steve Rogers' word isn't good enough for Fortean, which should tell you something of the nature of his quest. The most intriguing and new development that comes as result of "Thunderbolt" Ross as Red Hulk being tracked by a military man is that this battle is clearly going to be a chess match, a strategy session that's not on the same level as when Bruce Banner was hounded by the military. Of course, Fortean doesn't know that Ross is who he's after, and truthfully I'm not sure what his reaction would be if he did know. But I'm going to hazard a guess that sooner or later, he's going to at least tumble to the fact that he's facing a Hulk with a military acumen. It nearly occurs in this issue, and granted, Parker slyly wiggles Ross free of the point, but it shows just how much Fortean gets under his skin, right from the beginning. Fortean is aggressive, as he ably demonstrates throughout the issue. He's also not above using advanced modern warfare techniques which are going to prove increasingly interesting as time passes. This isn't the army of General Ross' time--it's deadlier. Add in that to this point, nobody outside a very narrow circle knows the Red Hulk's true identity, and you have an engaging "Hulk vs. Army" story for the first time in years. 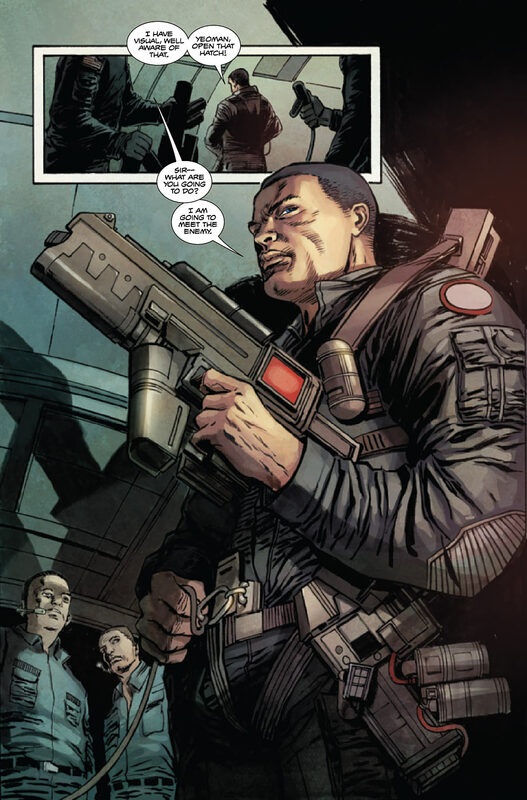 As clever as Parker's script is, even going as far as to give us a No-Prize-worthy explanation for why Ross had so often been labeled as both Army and Air Force, the art by Gabriel Hardman, Tom Palmer, and colorist Jim Charalampidis narrowly missed this book's usual excellent standards. I'm a big fan of Hardman's, as he's been truly impressive during the "Scorched Earth" arc; however, something about Palmer's old-school finishes didn't do justice to Hardman's breakdowns, and Charalampidis' colors are truly no match for regular colorist Bettie Breitweiser's dynamic palette. It's capable work, to be sure, and Hardman's underlying technique is terrific no matter the finisher, but the abrupt change--meant, no doubt, to get Hardman and Breitweiser ahead of schedule on subsequent issues (since Hardman usually inks his own work)--is very noticeable. So, is Hulk #30.1 worth the "low" price? If you haven't given the series a chance yet since Jeph Loeb left, there's probably no better time. General Fortean is just the first of several new villains who will be making their debut in this series over the next few months. Next week we'll see the introduction of a new villainess, Zero/One, who's tied to the "Scorched Earth" storyline that began the Parker/Hardman/Breitweiser iteration of this book. General Ross makes a solid protagonist who's definitely not Bruce Banner, whose monster is a distinct counterpoint to Banner's beast. If you're bored with the Hulk's recent adventures with his family, or if you long for old-school Hulk action with the familiar tropes--man on the run, big smash 'em up action, and the U.S. Army--then this Hulk series might be just what the doctor (not Banner!) ordered. I agree with pretty much everything Gary - the issue was a great read. Can't wait for the 3rd part to the Byrne years! Keep up the great work!